Why do I need a recipe separately for Mangshor Jhol when I already have Kochi Pathar Jhol on my blog? 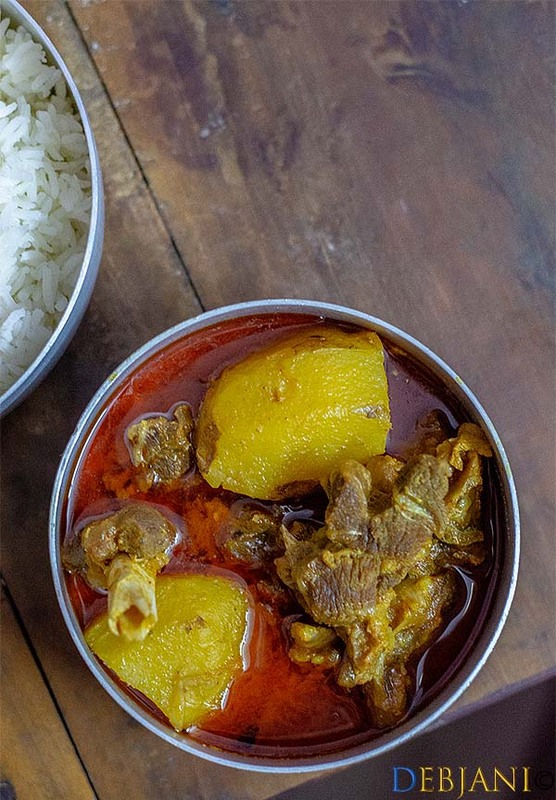 Well, why not when Kochi Pathar Jhol is all about the lean meat chunks from a smaller goat and that makes Mangshor Jhol different from the Kochi Pathar jhol! I do not imagine my portion of MAngshor Jhol without a few chunks of “Chorbi” (read, meat fat). This is the only justification from my side for coming up with this post! By the way do I at all need to justify me for writing about Mangshor Jhol? Nah I don’t think so! A dish I cook almost thrice in a month needs no justification for getting a place on my blog. 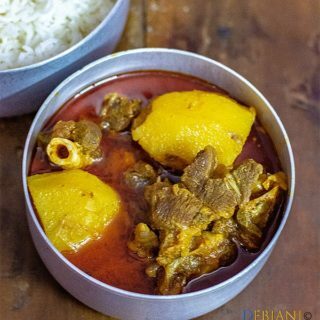 The bliss of having soft and succulent mutton pieces along with equally tasty and properly cooked Potatoes; not to mention the heavenly light yet sinfully flavorful curry is something I must put into writing. Oh, I forgot to mention the “Mete” (Mutton liver) and Chorbi (Mutton Fat) which I specifically ask the meat vendor to add to my cart. They make the dish complete. To understand the difference between Mangshor Jhol and Kochi Pathar Jhol you have to have both. I will not talk much about the authenticity of Mangshor Jhol Recipe or the process of cooking here. This is actually a dish your mother be the best cook to make; you can be the best roomie in a hostel to make; your husband/ wife/ partner can be the best person to put together, or it can be your first self-made Mangshor Jhol by your little one. Needless to say, the recipe varies family to family however not the emotion of having it with piping hot gorom bhat. Some people use Tomatoes while making the curry while some use Tok Doi (plain curd) and then there are families where they use both. The same difference applies to the use of chili. In some families, they use green chili while some prefer red chili powder. Apart from that, the use of basic spices is almost the same. Coming to the way I cook Mangshor Jhol, there are a few things I prefer while making it. First and foremost, I like a bit fat along with the meat to make the curry. This is, however, completely optional. 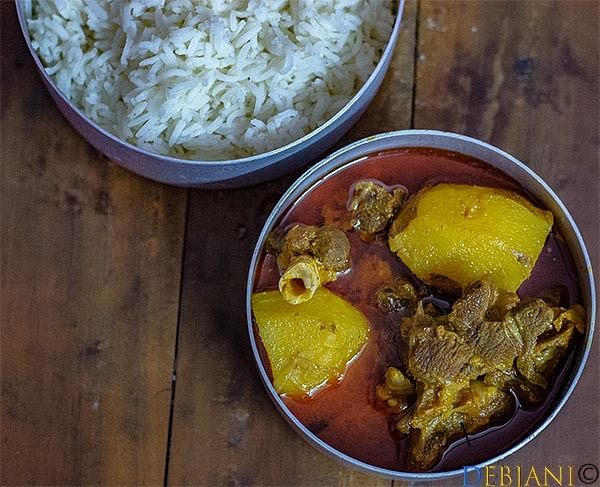 You can use lean meat only or can opt for typical Rewazi Khasi to make the jhol. I do not use tomatoes while making the jhol instead I add plain curd to it. I use a few green chilies for the hotness and Kashmiri Red chili powder for the color! When it comes to Mangshor Jhol, I prefer the red hot color. I, however, use very basic spices to make the curry; Cumin powder, Coriander powder, Bengali Garam Masala powder apart from salt and sugar. Here I must mention I use finely chopped onion instead of onion paste to make the curry. The reason is nothing but to sustain the simplicity and earthiness. Last but not least, I do not marinade the meat chunks for hours to make Mangshor Jhol. This is an epitome of comforting dishes and hence I prefer to keep the process simple. 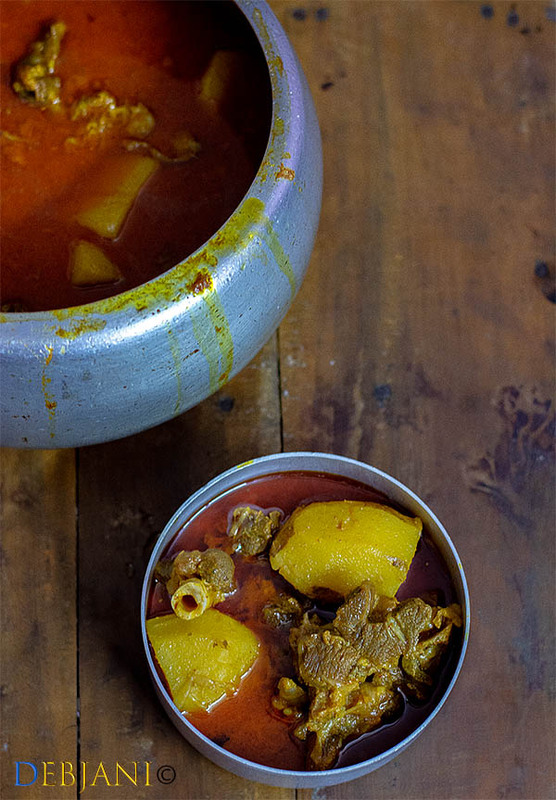 Here I must mention I use a pressure cooker to make the Mangshor Jhol instead of following the typical slow-cooking process which I follow for other dishes prepared with meat. Basically, the more apt title for this post can be Aloo diye Mangshor Jhol aka Bengali Mutton Curry with potato chunks in a pressure cooker! By the way, If you can manage Kather Jal (fire with wood) make Mangshor Jhol over it without thinking twice. The aroma of burnt wood infused in Jhol will take you to heaven for sure! If not available make maximum use of your age-old Pressure cooker. The “hsssssssssshhhhhh” of the whistle outspreading the aroma of jhol is as heavenly as the aroma of Mangshor jhol cooked over kather jal. 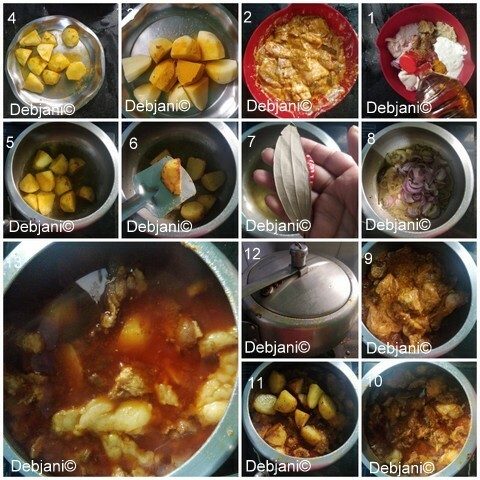 Here’s how I make Mangshor Jhol at Debjanir Rannaghar! Classical Mutton preparation from the Bengali households; Mangshor Jhol is light and comporting mutton curry prepared with mutton and potatoes. Bengali Garam Masala Powder: 1Tsp. Wash and pat dry mutton pieces along with liver and fat. Marinade mutton chunks with 2 Tbsp. Mustard oil and half of Kashmiri Red Chili Powder, Cumin Powder, Coriander Powder, Turmeric Powder, Bengali Garam Masala Powder, Sugar and Salt along with the curd. Meanwhile, peel the skin of the potatoes and cut into halves. Sprinkle a little salt and turmeric powder over the potatoes and coat. Heat the oil in a pressure cooker and start frying the potatoes. Once properly fried and golden in color strain those from the oil. Temper the oil with Bay leaf, dried red chili, and cinnamon stick. Add chopped onion and fry till those turn translucence in color. Now add Ginger and garlic paste and also sliced green chili and cook till the raw aroma of spices goes away. Add rest of the Chili powder, coriander powder and also cumin powder followed by sugar and salt and mix thoroughly. Now add marinated mutton chunks along with the marinade to the cooker and mix everything. Keep the flame low and cook for around 7-8 minutes by vigorous stirring. Meanwhile, boil 5 cups of water. Now place the fried potatoes over the meat and start adding boiling water to the cooker till the water covers both meat and potatoes. Put the lid on and place the vent weight as well. Keep the flame low and wait till one whistle comes out. Now increase the flame to medium and wait till at least 5 more whistles come out. Sprinkle Bengali Garam Masala Powder and add Ghee and give the curry a mix. Serve it hot with piping hot steamed rice. Adjust chili as per taste. You may skip Ghee completely. If using lean meat, you may reduce the cooking time a bit. Never add cold or water in room temperature while cooking mutton. Mutton Recipes from Debjanir Rannaghar! 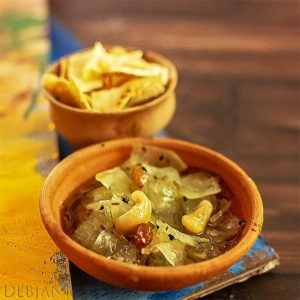 Have you tried the Mangshor Jhol recipe from Debjanir Rannaghar! « Grill by the Pool by Taj Bengal!